Shell peas. also known as English peas, were developed in Great Britain in the 18th Century. Of the garden pea variety, shelling peas grow in spring and early summer. They are harvested before the season gets too hot. Vinelike, the pea plants often need to grow on something for support like a stake, trellis or fence. Their name derives from the way the sweet green peas grow- inside a fiberous, inedible peapod. A naturally low-calorie food, peas are an excellent source of protein and fiber. Very low in fat, these green tendrils provide consumers with many minerals such as iron, potassium, and manganese. Vitamins C, C, folate, and thiamin are also derived from peas. The peas need to be removed from the shell before being cooked and eaten. To do this, look for the seam that runs down the side of the pod. Press the pod gently to break the seam, and then run your finger through the inside of the pod to get the peas out. 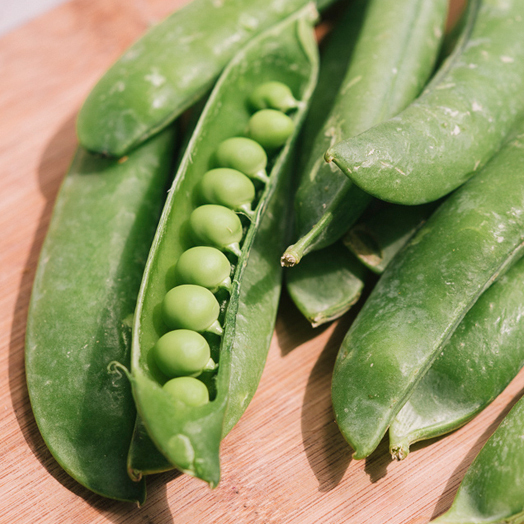 Though it may sound like a little extra work, pea shelling makes a fun family activity! Once removed from the shell, peas can be steamed, boiled, microwaved, or sauteed and they only need to be cooked for about 2-3 minutes. Shelling peas lose their flavor quickly, and are best when eaten as close to when they were picked as possible. Blanch peas and freeze in an air-tight bag in order to preserve the flavor and nutritional value if you are not going to use your pea pods right away.